Dualam Plastics Inc. is the leading manufacturer and field service installation provider of custom engineered fiberglass reinforced plastic (FRP) and dual-laminate composite products for use in corrosion-resistant applications primarily for the chemical manufacturing, power generation, and mining industries, amongst others. Dualam’s two primary operating divisions are CPF Dualam and Troy Manufacturing. Operating eight geographically diverse manufacturing and field service facilities in Canada and the U.S., Dualam provides turn-key product installation, field maintenance, and refurbishment services. 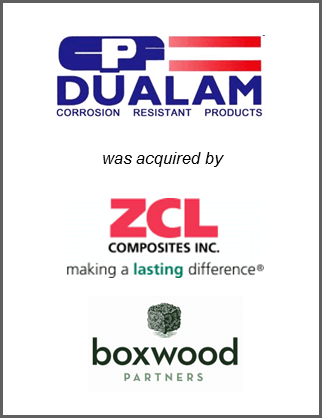 Boxwood Partners advised Dualam Plastics with respect to the sale to ZCL Composites.